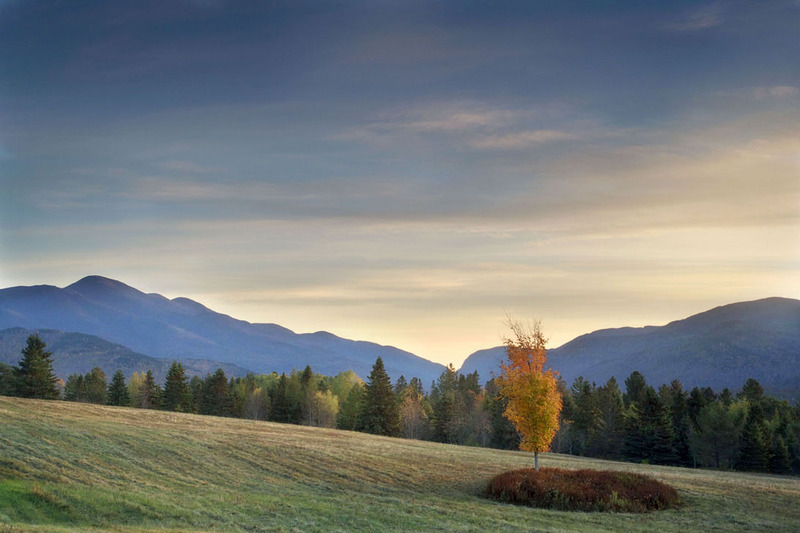 This is the second year in a row where I have made the attempt to follow the changing colors starting in the Lake Placid region of the Adirondacks also known as the High Peaks region. It always sounds like a great idea but your completely at the mercy of mother natures control of the elements that make up a spectacular fall season. In some locations on my trip I felt I just missed the peak colors and others I may have caught the tail end. For the second year in a row my journey began in the Adirondacks but this year it ended at the southern point of Shenandoah National Park in Waynesboro Virginia rather than New Jersey. A somewhat of an easy drive of 5 1/2 hours from my house, assuming no traffic , the Adirondacks offer a wealth of photographic opportunities. I’m still learning the terrain up there though. It’s only the second time that I’ve been there and finding locations that appeal to me is part of the adventure. In speaking with the locals it seems that traditionally the last weekend in September and the first one in October are the peak weekends. Last year I went in September and this year in October. I felt that it was just past peak this October. Mother nature and I weren’t in sync on this trip. Don’t get me wrong the colors were beautiful but they were spectacular last September. The High Peaks region may have been slightly towards the end of the fall color cycle but an hour or so south in the park it was amazing. Good to know for next year. The local weather report called for cloudy skies on my first morning. Heading out that morning I drove to some popular spots but again not knowing the locations well enough and the how the light would react the morning started out slowly. What I learned on this trip is that the weather can be great in one area but 5 miles or even less in another direction it can be completely different. As I started to drive back the skies began to change and open up. I was really hoping for some beautiful light to shoot and the actual content of the image I would figure out later. The clearing morning fog combined with the developing clouds was happening quickly and it set up for an entire morning shoot in and around Marcy Park. Earlier I said that my creative vision is changing. I’m trying to capture images that have a feeling that your standing there with me soaking in the changing light and the general atmosphere. I’m not looking at purely documenting the location but trying to have you experience it with me. It’s difficult, not always successful but creatively challenging. While this shot may not be exactly overwhelming in terms of content I love this image for the light and the feeling it has. For as outrageous as the landscapes can be in the region it also has many smaller quieter sides of life. The light was just beautiful as it broke over the horizon and hit the mountains in the distance. That house in the image is owned by the town and quickly became part of the composition. The only person around that early in the morning was a town worker checking on facilities in the area. A quick conversation revealed that this large open area is a landing strip for small planes. It was perfectly fine for me to be there and shoot but he said “ just watch out for planes”. The next image was taken taken along LOJ road. I was with my wife and I had a feeling that a good sunset may happen that evening so we headed out to find a good spot to shoot. I was aware that this is a very popular place to shoot sunsets and sure enough I was not alone. It’s a long road that affords plenty of space to shoot though. One of the things to get used to up there is the concept that much of the land is privately owned. Even areas that can be hiked may be on or adjacent to private property. If a sunset could be quiet than this is the one. There were no flaming colors, no crazy cloud formation just a blend of subtle hues that illuminated the surroundings. As with the house in the previous image I needed a focal point in the lower portion of the composition and the lone orange tree was perfect. 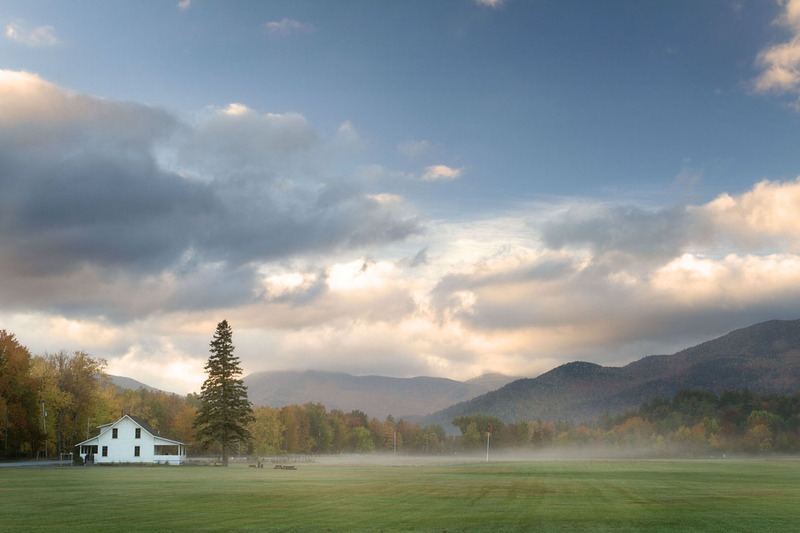 The mountains in the shot are some of the High Peaks that lay just South of Lake Placid. The quality of light and depth of the image make it a successful one for me. Comparing the two images illustrates were my mind was and is creatively. They are both very similar in my attempt to capture and portray what I saw and felt. I’m already anxious to return the Adirondack region to explore more areas but I have a feeling that I will not wait for the fall to make that happen. This entry was posted in Locations, Photographers by Larry Zink. Bookmark the permalink.